HEPA filters and ULPA filters both ate used in HVAC systems in pharmaceuticals. Both of these filters are used to clean the air but these both have difference in their working and performance. The two main types of air filters employed in biosafety cabinets, pharmaceutical manufacturing, electronic goods manufacturing, room air purification, and vacuum cleaner filters are High-Efficiency Particulate Air (HEPA) filters and Ultra-Low Particulate Air (ULPA) filters. Both these filters are designed to catch and remove tiny, airborne particulate matter such as bacteria, pollutants, and dust particles from the air. Fabricated using similar technology, both HEPA and ULPA filters are made up of innumerable randomly positioned 0.5 microns to 2.0 microns sized boron silicate fibers that cause contaminants to stick to them through electrostatic attraction and other physical mechanisms. However, there exists a difference between HEPA and ULPA filters in terms of their filtering efficiency, air flow capacity, price and lifespan. One key difference between industrial HEPA filters and ULPA filters is in the size of the particles they can remove. While HEPA filters can remove up to 99.97% of contaminants as small as 0.3 microns in diameter, ULPA filters can remove 99.99% of the particulates that are 0.12 microns or more in diameter. Standard HEPA filters such as HEPA C and HEPA J are said to remove 99.99% of the particles between 0.2 microns and 0.3 microns. In contrast, standard Type K and F ULPA filters are said to remove 99.999% of the particles between 0.1 microns and 0.3 microns. Thus, ULPA filters can trap more and smaller particles than HEPA filters. Related: Why do HEPA Filters have 0.3 Micron Pore Size? The difference between HEPA and ULPA filters also lies in their capacity to move air through them. Since the filter media of the ULPA filter is denser, air flow is 20% to 50% lower than that in the HEPA filters of the same dimensions. 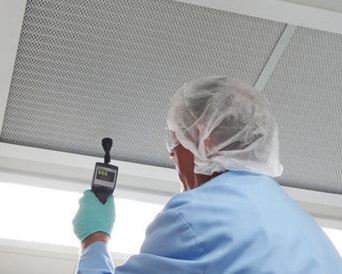 As a result, air circulation is lower in rooms or biosafety cabinets with ULPA filters and more power is consumed by the blower to move the air through the filter. Since ULPA filters are more efficient in filtering contaminants, they are typically more expensive than their HEPA counterparts, with the percentage cost difference between HEPA and ULPA filters being approximately 35%. Another important difference between HEPA and ULPA filters lies in their average lifespan. On an average, the HEPA filters last for about 10 years, whereas the ULPA filters offer a lifespan of 5 to 8 years. Since HEPA filters allow for better airflow, theoretically, they will require a longer time to reach their maximum filtering capacity. This implies improved longevity for the HEPA filters. Thus, the lower price and longer lifespan of the industrial HEPA filters result in lower ongoing maintenance costs than that for the ULPA filters. Thus, although ULPA filters are more efficient in filtering smaller particulate matter than the HEPA filters, they are more expensive than the latter. Also, since the fiber media in ULPA filters is denser, a more powerful blower is needed to maximize airflow in the room. Together, these increase the initial and operational expenses of ULPA filters, thereby making HEPA filters a more economical option. Practically too, HEPA filters are more than adequate for most biological applications, whereas the ULPA filters are suitable for the semiconductor industries.